Brick Nintendo before they brick you! The Nintendo 3DS comes with Terms of Service (TOS) that should not be accepted. To enforce these terms, Nintendo uses Digital Restrictions Management (DRM) technology. Because of the Digital Millennium Copyright Act (DMCA), users are legally prohibited from modifying their devices to block Nintendo's nastiness. 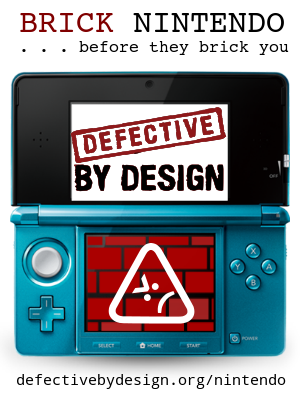 This combination of legal and technological restrictions makes the Nintendo 3DS dubious, devious, and defective. This page outlines some of the nastier parts of the DRM-enforced TOS. Join us in delivering a message in protest to President and COO Reggie Fils-Aime, by sending him a bundle of bricks along with a letter explaining the issues. Make a small donation before May 18th and we'll send a brick or several on your behalf (please note we will still accept orders past the the date of May 18th). 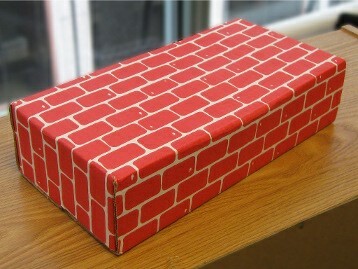 To read the letter that will accompany the bricks, see our Brick Nintendo blog post. Please note just how absurd this claim is when you consider something like the photos taken with the 3DS camera. Can you imagine Canon or Nikon claiming the right to use pictures taken by you with one of their cameras? Can you then imagine them calling you a criminal for modifying the software on the camera to keep them away from your pictures? The Nintendo 3DS will send the Activity Log to Nintendo when the wifi is connected. Nintendo can then choose to share your information and use it to target advertisements to you. Nintendo states that they "may update or change the Nintendo 3DS System or the Nintendo 3DS Service in whole or in part, without notice to you." This includes "embedded software" — aka the firmware on your device (Chapter 6, Nintendo 3DS End User License Agreement). Children who use the 3DS are expected to know that they shouldn't share any "personally identifiable information" (PII), with their 3DS. That's right, children under 13 should not use their real names to create their game nickname, take pictures with the built-in camera, or participate in any number of ways the 3DS is set up to encourage. If they do, Nintendo claims the right to use their photos, give their information to 3rd-party companies, advertise to them, and more. If children shouldn't use the device for what it is made for, then why is Nintendo marketing it toward children? Make a small donation to the campaign and we will send a bundle of bricks on your behalf along with a letter — orders should be placed by Wednesday, May 18th! Or, order the bricks yourself, assemble, and then send them to Nintendo along with your own custom letter. Please share this story with your friends on social networks and by email. The more bricks, the merrier! Add a Brick Nintendo banner to your blog or site by pasting one of the HTML code snippets below. Have you translated this story or any other documents relating to our Nintendo action? If so, email it to us at info@defectivebydesign.org.